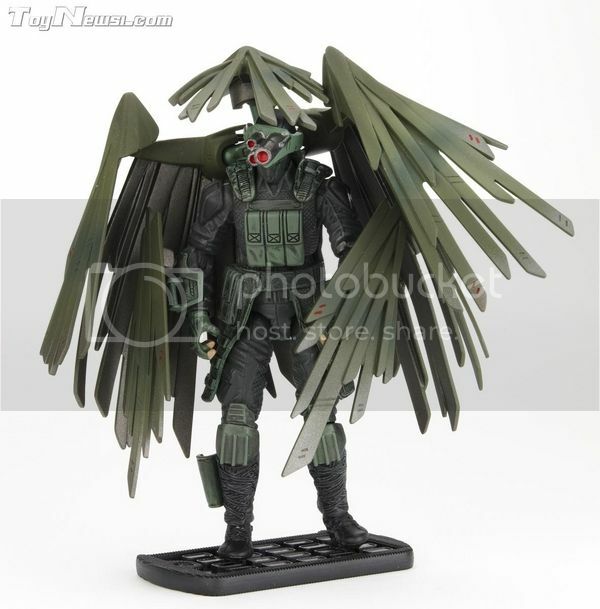 This Cobra Jungle Viper* figure is among the G.I. Joe 3 3/4″ figures announced at Toy Fair 2010, which is visiting New York City this week to highlight all the latest Chinese-made lead-based products for children. Obviously, neither practicality nor stealth is priority #1 in the Cobra’s version of jungle warfare. Otherwise, the Commander wouldn’t be saddling his soldiers with small, ramshackle huts made of artificial palm fronds as they’re trying to make their way through the thick undergrowth. If this is Cobra’s idea of jungle camouflage, I think I’m beginning to understand how those G.I. Joe meat heads always manage to win. * Did you perhaps think it was a lame reboot of Spider-Man’s nemesis, The Vulture? Then again, nobody accused the Imperial Empire of being stealthy – between their AT-ATs, Super Star Destroyers, and Death Stars – it’s obvious they preferred intimidation to stealth. I recall hearing that this is, in point of fact, both practical and stealthy, as the tech details are meant to suggest a holographic camouflage… in other words, he’s a sniper Predator. Yes, it is definitely holographic as printed on the card on the back of the figure. I love these new GI Joe figures. A lot more detail than ones prior. Also, the guns come out of the holsters, which is great, considering all the weapons I had from old figures were lost all the time. My favorite right now is probably the Firefly figure.